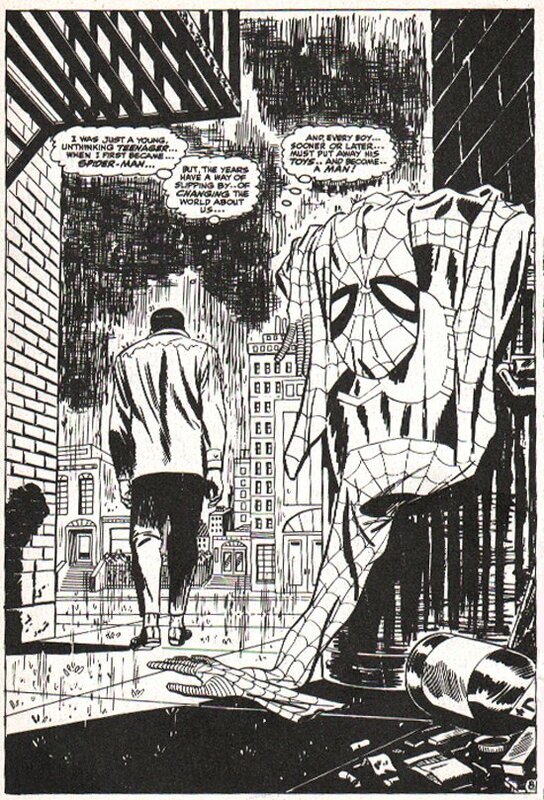 Click Here To See Amazing Spider-man #50 SPLASH! 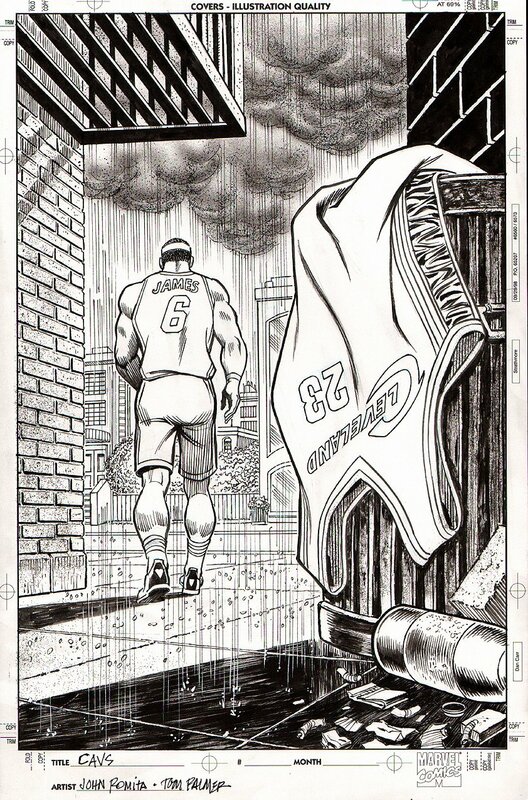 Check out this very nice Published Pinup which was drawn by the great John Romita Sr. as he recreates one of the greatest, most remembered images in the entire HISTORY of Marvel Comics, as he draws this almost IDENTICAL pinup for sports Illustrated Magazine in their 2010 NBA Basketball preview! 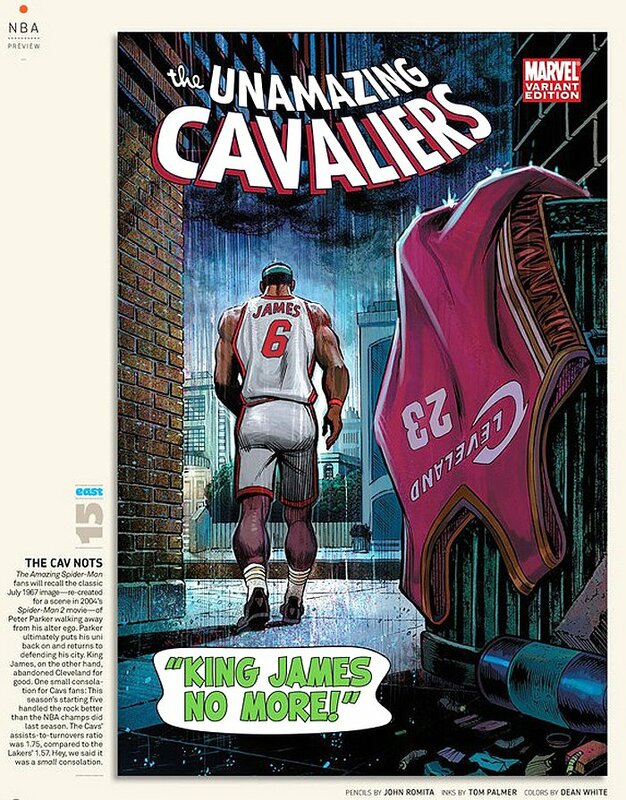 This splash pinup features Lebron James throwing his Cleveland Cavaliers basketball uniform in the trash can as he walks away while wearing his NEW Miami Heat basketball uniform, in the same exact manner as Peter Parker, when he threw away his Spider-man costume in the historic 1967 SPLASH page in Amazing Spider-man #50! This Pinup COULD AGAIN BE USED TODAY with Lebron James throwing his Cleveland Cavaliers basketball uniform in the trash can to walk away wearing his NEW LOS ANGELES LAKERS basketball uniform! Art is signed at the bottom! Just a neat Pinup! Compare this nice pinup to the AMAZING SPIDER-Man #50 splash in the red link above, and compare it to the published Sports illustrated 2010 color page in the red link above! ALL art on our website (including this one) are able to be purchased with VERY fair time payments, and trades are always considered towards "ANY" art on our website! Just send us an email to mikeburkey@aol.com and we can try to work something out.